Is it not cool to bring school books to school? At the age of 15, I am still getting complaints from school about son not bringing textbooks to school. I seriously can't figure that out? We were with the counsellor last Tuesday and she asked him what or rather how he wanted me to react to him. After getting all his answers, she popped him a question. Isn't your mom's job hard to do? No matter how I react, I can never please him. I wish days I don't have such responsible to him. It is so tiring being his mom. Just this morning, my friend's husband was telling me that as long as he is provided food, roof over his head and safety, I shouldn't be really bother by anything else. I should take care of my own well being. I seriously wish it was that simple. Or is it really the parent's role when you have a teen these days? I don't recall my parents had to deal with all these when they were raising me up!!!! ya,I am sure my son, if he is reading this will tell me that we are from a different era! Now I fully understand why so many of my friends just refused to have kids! The responsibility is not only great, it is difficult. Now to keep my well being in control and at peace, I have to live on the memory when he is just a sweet young boy who is absolutely adorable and sweet and patiently wait till this terrible phrase to go by. As I have some leftover water roux paste, I chose to bake a Chocolate Chip bread . Since I baked for my girl yesterday, so today I baked it especially for my son who has a terribly sweet. (yes, I was baking this when this upsetting email came through). The dough is especially easy to handle. Unlike the sticky dough that I encountered yesterday, this one was a breeze to handle. I incorporated a tablespoon of chocolate paste just to intensify the flavour. The texture is fluffy soft. My girl, helper and myself really like it alot. Now let's hope my little man will too and also remember what I told him today. I tried three recipes from this book and I am confident that the rest of the recipes will work equally well. Seriously considering to add this book into my collection. 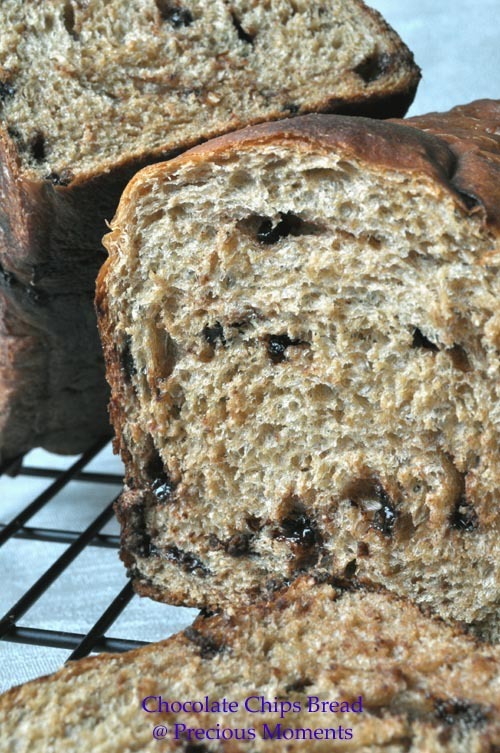 The chocolate chip bread looks yummy! How to Love difficult people? It is a mistake to feel that to love someone means we have to give them what they ask for. Real love means we will consider their real needs and not necessarily what they demand. If a young child wanted to take poison, the mother would never allow it. If someone places an emotional burden on us, we don’t have to encourage it. Love may require a degree of detachment, it may require point out to those who we love, there are better ways of being. It is good to have empathy and sympathy with other people, but that doesn’t mean we need to agree with their viewpoint. We can have sympathy with their position, and offer practical ways for them to choose the best course. But, we don’t have to feel responsible for their actions and choices. what's the name of the baking book that you're mentioning here? it's not easy to read and understand one's mind. Is he under study pressure a lot or maybe he's also under some emotional stress that you're unaware of? Don't give up Edith, I'm sure your son would appreciate your efforts and love one day. Sometimes, its a matter of learning to let go, The tighter we try to hold fine sand within our fingers, the more it would seep through the crevices. Your son is going through a phase in life. Sometimes, its easier for a person to learn after they'd a fall. But as parents, I guess its really difficult to do that.